Everyday write down three things for which you are grateful. So say the self-help folks, creatives, going strong entrepreneurs, and positive psychologists. The idea is that focusing on the positive and writing while focused strengthens your neural pathways, a cognitive exercise that builds the mind’s ability to see beyond its constructed walls and limitations, allows you to open into possibility. Gratitude opens imaginative doors, and memory and writing are gratitude’s empowering exercise. I’ve practiced this off and on during my years of journal keeping, but I’ve only felt a conscious shift the past few years. Way back when, I practiced gratitude for five minutes a day in my journal, yet fretted most of the remaining 23.95 hours. Not consciously, but habitually. I’m finally getting it. It’s about taking your gratitude with you, seeing each new day through a supple world view imaginatively reborn, not relegating your “gratitude” to five minutes a day while never removing your anxiety blanket. But five minutes a day is an important start, and no doubt those five minutes everyday helped me get closer to a better pace. Sometime in January, maybe February, I listened to an interview with Elizabeth Gilbert (hyperlink to her TED talk, not the podcast I heard) and she described her gratitude jar. Every day, she writes down three or more things for which she is grateful on a slip of paper, then puts them in the jar. Come the New Year, she has a ritual around reading and remembering the year’s many gifts and joys. Every January, she begins again. After listening to Gilbert, I grabbed two mason jars — one for fears and worries, one for joys and gratitudes. I decided to experiment with the fears jar. Though I haven’t read much on this practice — I think it’s important to name fear, label the gnarly monsters, write them down, and shove them in a jar. I’m not yet consistent with this practice, but it’s good for now, and getting better. What I’ve discovered is that by writing down my fears, and putting them in the jar, I’m symbolically giving them to my higher power, even if that Power is my imagination. Some days I refuse all fear and boldly write: NONE! By writing down incidents, people and things for which I’m grateful, I’m documenting what I otherwise forget, no matter how small or big, small and large ultimately being arbitrary distinctions. I try to include things otherwise invisible, to go deeper into my daily experience, try to ferret out the things I take for granted. For example: a random encounter that shifted my mood, allowed me to be a better person after someone else’s kindness. 2) I quickly forget how many beautiful surprises fill my life everyday. Experiences, circumstances, people that turned a day, a week, a month around, happenings too quickly swallowed by life’s activity. My life deserves better than fear, and it deserves better than for me obscure its Beauty with necessity. 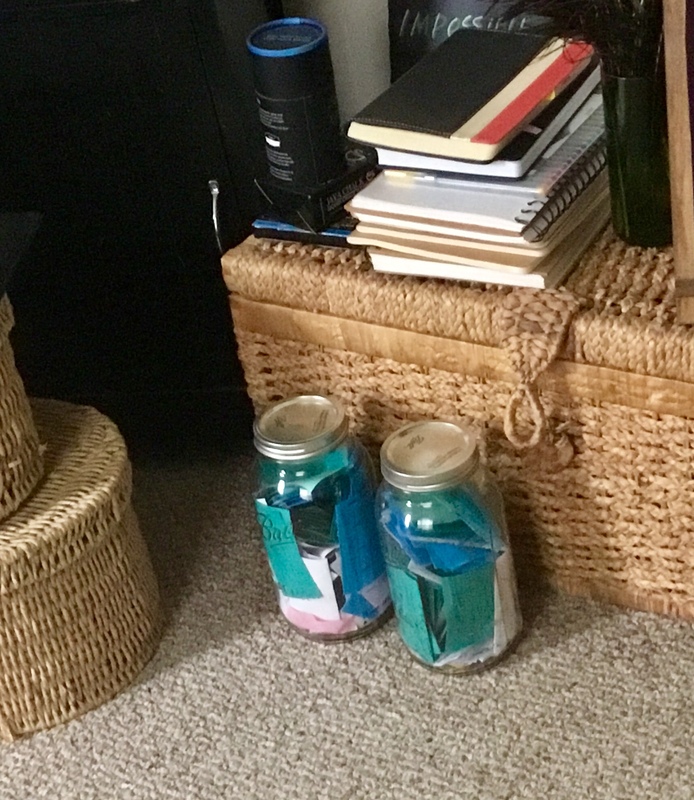 So I have two large mason jars sitting on my living room floor — one filled with some psychic chaos and rumblings, and the other with beautiful memories and everyday happenings. Life is an art, this is now one of my modest practices sustaining that art. I look forward to my first New Year’s ritual this year, unfolding slips of paper wearing my unfounded fears, and rediscovering the wonderful moments that I too quickly forgot.